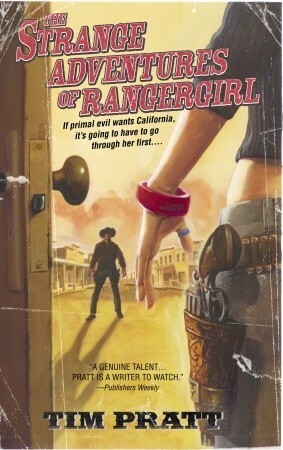 But Rangergirl isn’t a fantasy set in the Old West. It’s a novel about a comic book writer and artist, Marzi, who lives in present day Santa Clara. The Strange Adventures of Rangergirl is the name of her comic book, which is set in a fantasy version of the Old West and which she produces from her apartment when she’s not working her full-time job as night manager at Genius Loci, a coffee bar in the same building in which she resides. As the novel opens, some of her friends and acquaintances have started acting rather odd. A former art student college acquaintance of hers and frequent patron at the coffee shop, Beej, is now muttering about an earthquake god and helping the god in its quest to bring destruction. In addition, another former college acquaintance, Jane, is now blaming Marzi for either indirectly or directly keeping an earth goddess locked away somewhere inside Genius Loci. Angered over this, Jane physically attacks her, and during the attack Jane no longer appears human. In fact, she seems to be made entirely of mud—just like one of the characters in the Rangergirl comic. Like any good heroine, Marzi eventually deals and starts facing the growing crisis that’s threatening her friends and the post-breakdown life she settled into. Once she does, Marzi begins to realize that her breakdown, the Rangergirl comic, the strange behavior of her college acquaintances, Genius Loci, the artwork that adorns the shop’s walls, and Garamond Ray, the long-missing artist who created them, are all related to a budding supernatural crisis facing Santa Clara. Furthermore, although she can rely on Lindsay’s and Jonathan’s help, Marzi’s the only one who can save the town and stop an ancient malevolent force that inhabits the area and has taken the form of The Outlaw, the villain in her comic and a force simultaneously acting as the deity that Beej and Jane seek to serve. The truly amazing thing about Pratt’s novel is how well he layered it. Given that Marzi’s comic is related to the supernatural events threatening to engulf Santa Clara—almost paradoxically, we find that Rangergirl the comic was inspired by Marzi’s first encounter with The Outlaw (which also caused her breakdown years before) but afterward actually dictated to a degree his actions and decisions — Pratt wonderfully exploits the parallelism between the novel and comic. Many of Marzi’s adversaries seem comic book-like in their complexity, almost to the point where they are stock characters. Yet, because they are really human beings, they harbor the ability to break out of their assigned roles. In fact, Lindsay’s girlfriend, Alice, leaves town when she realizes that something indefinable is attempting to influence and dictate her actions. Marzi and a couple of the other characters eventually recognize the duality and even attempt to use it to their own advantages. However, the paradox of this is that The Outlaw is actually confined by the mores of the Rangergirl comic, so Marzi must be careful in how she chooses to confront him. Things get a little stickier for Marzi when she briefly finds herself actually navigating another world based on the comic in order to save one of her friends. That duality is just part of the way Pratt sets and then adheres to the rules of his fantasy world. Like good science fiction novels, good fantasy novels set parameters for the fantastical elements. If anything can happen without proper instigation or consequences, then nothing is truly surprising. One of the key elements to Rangergirl the novel is the ability that Marzi, and other characters to a limited degree, possesses to alter both The Outlaw and the environment she shares with him because of her artistic talents. However, Marzi cannot stop him by sheer will alone, nor can she just make alterations that she thinks will make him easier to defeat, because any alterations she — or any of the others, for that matter — makes are taken to their logical extreme. Thus, imagining The Outlaw as a different type of villain, say a djinn, changes how he acts as well as the methods that one can use to defeat and contain him. In a similar vein, strict rules dictate the actions that Marzi, Lindsay, and Ray undertake during a metaphysical journey through Jonathan’s soul. Beyond the fantastical, there is plenty more to like about Rangergirl. It’s an action-packed novel that keeps the story moving at a pace you’d expect from a comic featuring a heroic figure from the Old West. At the same time, it’s also an introspective novel, one that examines the psyche of a character who has experienced a mental breakdown and is trying to face some of the demons associated with that. Through the way Lindsay remained Marzi’s friend since before her breakdown and the way she stands by Marzi during the final showdown with The Outlaw — Marzi gives her the opportunity to back out before the battle — the book also shows the bounds of friendship and how true friends help one another in tha face of adversity. Furthermore, given that it’s up to Marzi and her artist friends to stop an evil demigod from destroying Santa Clara and much of the surrounding regions of California — and the fact that an artist stopped The Outlaw during his previous attempt to wreak havoc in the area — it certainly looks like Pratt has something metaphorical to say about the importance of artists to society. All of these elements help make The Strange Adventures of Rangergirl an enjoyable debut novel. In addition to tapping into the western mythos, Pratt draws upon the comic world for inspiration, addresses the value of friendship, and points out just how much society needs our artists. In doing so, he creates a uniquely American fantasy work. None of the traditional fantasy creatures appear, nor are the protagonists people who readily accept that the lines of reality are breaking down. Yet, like all good fantasy, there are rules that govern supernatural forces at work in this world, and once the characters come to understand them, they attempt to use them to their advantage. Most importantly, you don’t have to be a fan of comics or have knowledge of the old west to enjoy the book (indeed, Marzi opines that what most people know of the old west isn’t actually true). One just needs to enjoy a good action adventure story to like this book. This entry was posted in Book Review, Matthew Appleton, Tim Pratt. Bookmark the permalink.